My first post here was entitled “The importance of blue.” That was August 8, 2010. Nearly 5 years have gone by, and in those 5 years, so much has happened, hasn’t it? For you, I hope they’ve been 5 amazing years of joy, health, discovery and happiness. But 5 years wouldn’t be 5 years without—for all of us—countless transitions. And as we all know, they can’t all be graceful, can they? Moves. Aging parents. Growing teens. Evolving work situations. Hormonal ups and (mostly) downs. And Italy being Italy, the usual barge-load of bureaucratic calisthenics. These have been mine. I know you have your list too, but sometimes the best thing to do, the wise smart survival-oriented thing to do, is to let that list go. It gets heavy to carry around. And it’s not so good for your health, is it? It would be much better to be defined by a weightless sense of joy that has pervaded the years, somewhat akin to, well, the scent of lavender. Something that can hardly be defined, but which fills us with an ineffable and impossible to define feeling of tranquility. Yes, lavender is important. Whenever I come to France in the summer, sooner or later I conduct what I laughingly refer to as my lavender “harvest.” A harvest requires a farm, I think, and I’ve got less than a dozen border plants. But those lovely bursting (and forgiving) shrubs, and the simple chore of shearing them, do me a world of good. I can be an impossible ball of tension, and yet kneeling into them, cutters in hand, bumble bees buzzing about my ears, puts me right in a matter of minutes. Maybe less. The pile of lavender is growing in my kitchen. It needs to be bundled and dried…though I’m a bit behind schedule with all of this. It should be done in late Spring, I believe, but that is impossible in our case. The Italian word for wash is lavare. A laundry is called a lavanderia. Lavender, since ancient times, has been used to ward off harmful insects and to guard against bacteria. It has been, in other words, inseparable from the very concept of being clean. So it is no wonder to me, that it cleans our minds as well as our linens. The great botanical reset button. 1. Lavender oil has antiseptic properties. 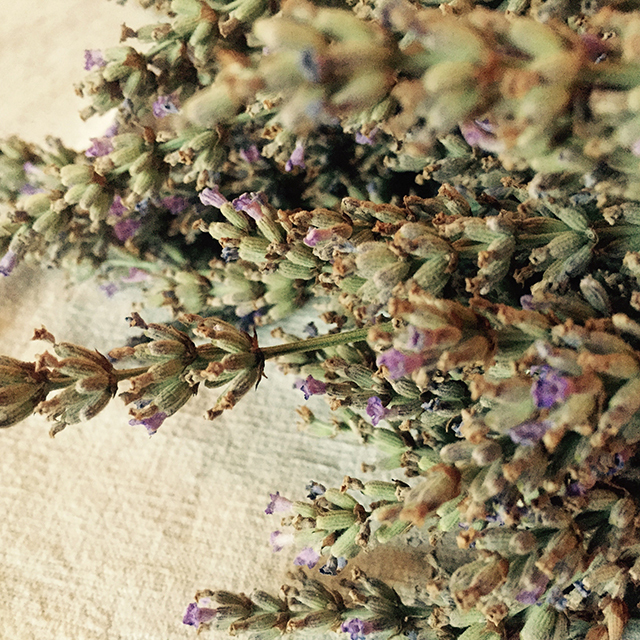 The oil of lavender is extracted from the actual flower and not the leaves or seeds. It is good for cleaning scrapes and cuts that may contain foreign material. Use lavender oil to clean surfaces in your home to lower your bacterial count. 2. Linalol is an active substance in lavender that heals sores, burns and other wounds. Pain and inflammation are reduced at the site of pain. 3. Lavender reduces anxiety and other nervous conditions. Create a sachet with soothing leaves and tuck it into your drawer or under your pillow. Add essential lavender oil to your bath water for a calming bath. Use water infused with lavender leaves to soothe painful joints and muscles. 4. For headaches, apply lavender oil to a cotton ball or your fingertips and massage slowly into your temples. The smell will relax you as the oil eases your headache. 5. Lavender is used in aromatherapy massage as a muscle relaxant. Massaging the oil into the skin unknots the muscles of the back and reduces a spasm, which can be helpful during a woman’s menstrual cycle. 6. Using lavender in an oil diffuser helps with insomnia. The sweet woody smell of the lavender oil helps you to fall asleep and stay asleep. 7. Lavender has also been used as an expectorant. It breaks up the mucous from nasal and chest congestion that accompanies a cold. It is also useful in remedies for other respiratory conditions. 8. Lavender can be used as a tincture to treat fungal infections such as vaginal yeast. 9. Lavender can be taken as a diluted essence. One or two drops of the essence in a glass of water can be taken internally for many conditions such as depression, hysteria, and fainting. 10. Inhaling lavender oil can help with pain management, especially after surgery. So prodigious is this plant, that simply looking at it calms me down. These colors are the colors of letting go. If memory is the thing that binds us to our past, nerve-wracking experiences, it is also the thing that binds us forever to our greatest joys. And those memories of bliss can be triggered with the sight of these hues combined in their graceful botanical iteration, or with one deep breath of the associated perfume. Have a lovely day. I wish you well. And here’s to 5 more precious years. 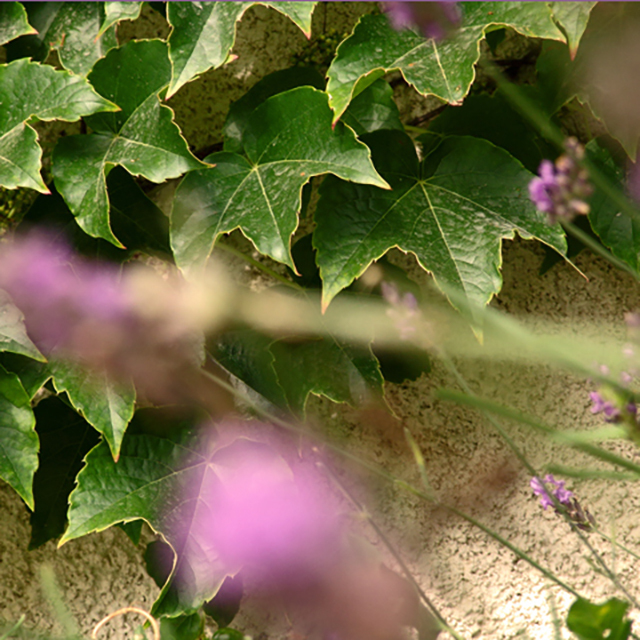 This entry was posted in AROUND US, COLOR, FRANCE and tagged Bourgogne, Burgundy, flower, France, lavender, therapy. Bookmark the permalink. I love lavender. 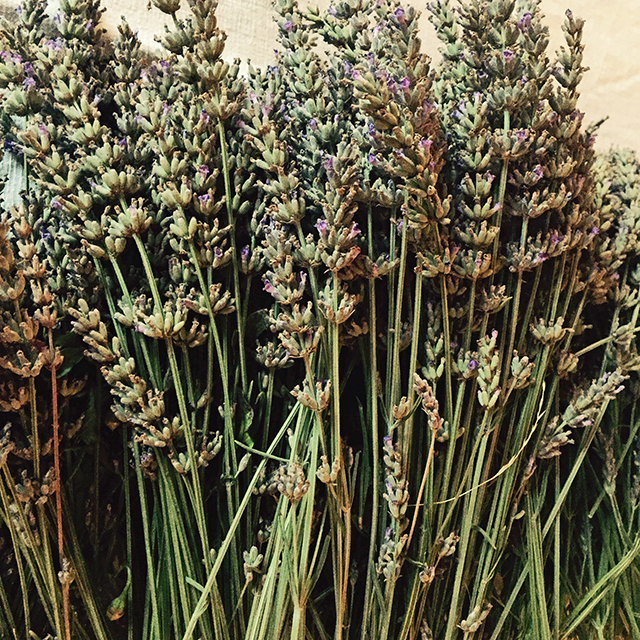 We have about 200 lavender plants at Casa Debbio. I will be back there in 6 weeks to walk past them and enjoy their heavenly smell. The flowers never seem to open before I leave in June and by the time I get back in September they are past their best, but the perfume is still wonderful. Like you, I will be picking bunches to have in the house. Later I will be pruning the plants to stop them growing too big and becoming straggly. It will be quite a big job this year. Yes, but I smell wonderful afterwards. I love lavender! I also love the color lavender and use it lavishly in my gardens. 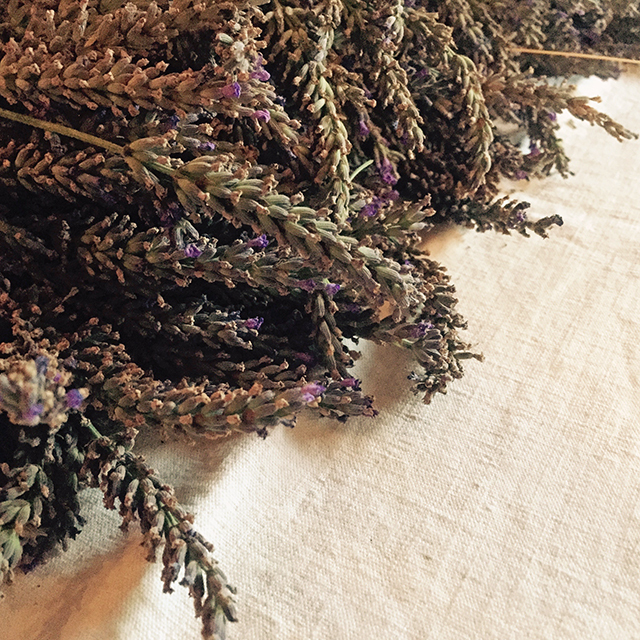 What fun things do you do with your dried lavender? Soap, scents for drawers, your closet. Just to brush you hand against and remember summer, sunlit days? I’ve noticed lots of lavender color in your garden! Hey, what is the name of that other plant that you have which looks sort of like lavender but is not? I have that too…I am going to try and branch out this year with what I do with it, since I have so much more than usual. I saw a nice little article about making hand warmers with it for when the cold weather comes. That could be nice. Also, face and body scrubs…and I’ve seen recipes for homemade fabric conditioners and things. I need to post about all this as well. Oh, please do. The huge lavender plant I have so much of is called Russian Sage. It doesn’t smell as lovely as lavender, more of an astringent smell like sage brush. Yes, that’s the one! I can’t remember what they call it here in France, but I’ve planted it as well. It seems pretty hearty. I mean, the weather here is all over the place, and it survives our neglect as well. That’s my kinda plant. What a lovely post Charlotte, your writing always enriches my day . Thank you. I love the smell of lavender and it is everywhere in my house. My outside lavender plants are not doing well due to our drought. Thank you! We’ve had drought here too, and I noticed that the leafy parts of the plant were quite weak this year, while the flowers were shooting everywhere. Sadly I’m not in France enough to prune them properly. The reading I’ve been doing indicates that ideally they’re pruned two times a year. Spring and early fall. And I can only do it in the summer. Oh well. They forgive me!